I cannot tell you how excited I've been for this day! 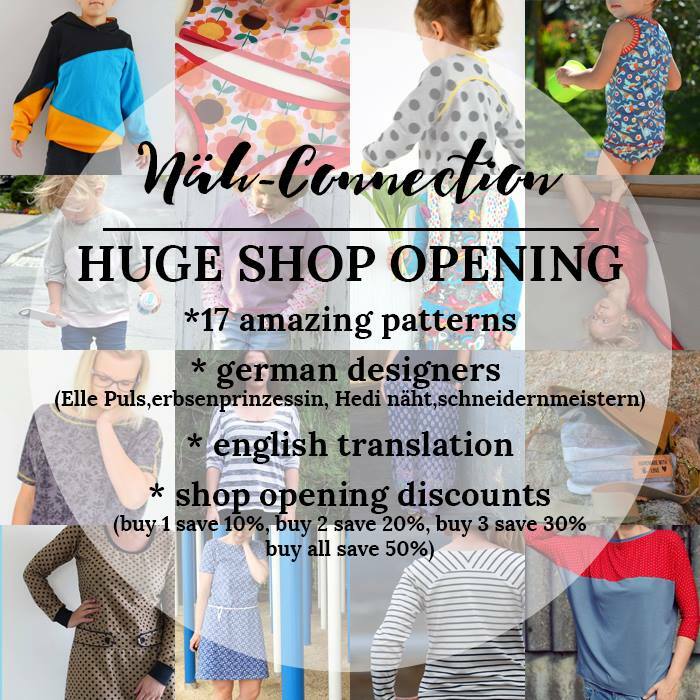 I've been a long time lover of European patterns and when Annika said she was going to start working with designers to translate patterns, I did a very, very happy dance and I'm over the moon excited to be part of her Ambassador team! So far 17 awesome patterns by 4 designers have been translated and are in the shop. 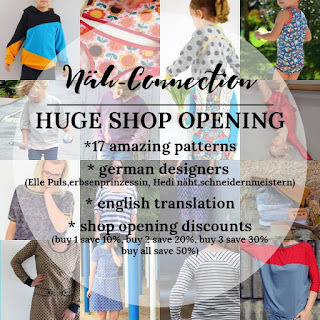 Of course with a new shop opening, that means there's an amazing sale going on. 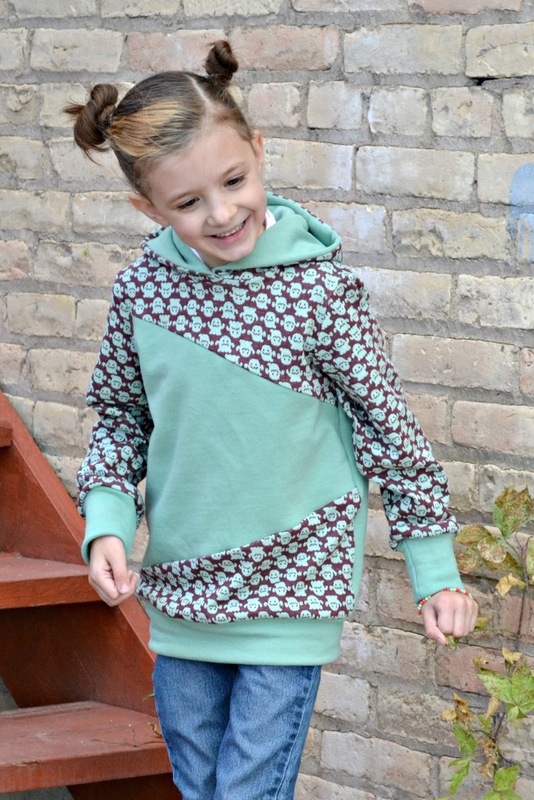 Buy all 17 patterns and get 50% off! The sale ends October 9th at midnight CET time so make sure you take advantage of it! 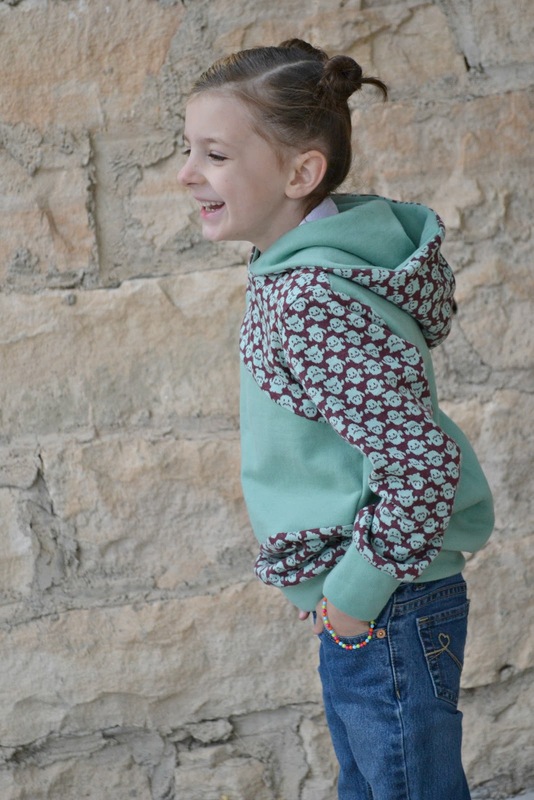 Now onto the review of our Longihood by Erbsenprinzessin! 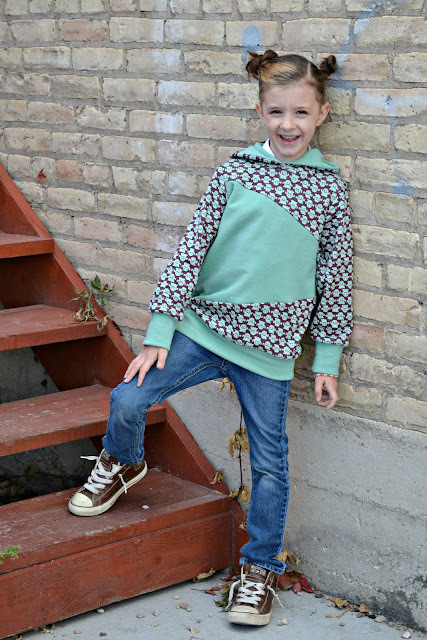 This pattern comes in sizes 80-134, which in US sizes that's 12 months - 8 years. You get 2 different silhouette options, a shorter straight length meant more for boys, and then a more fitted, longer length for girls. There's the option of a hood or a wide collar. Then, there's the colorblocking options! We made size 110 (5) in the shorter straight length, with hood and all the colorblocking bells and whistles. I did lengthen the arm bands to make it long enough for my little bird to wear. The pattern calls for a heavier weight knit, such as French Terry, Sweatshirt Fleece, Fleece, etc. and then Rib Knit for the arm and hem bands. 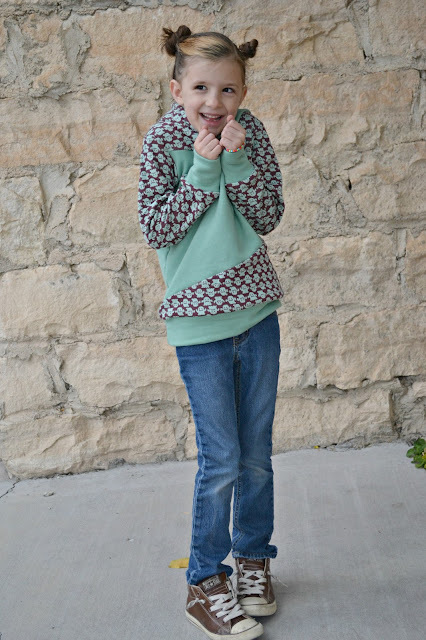 For ours I used Japanese Interlock Knit in a Ghost print that I bought from Miss Matatabi. Dudes, Frances has magical powers. She's based in Japan but I swear I get her orders faster than I get my orders shipped to me in the USA. How she does it, I don't know, but it's amazing. And all of her fabric is amazing. I very regrettably only bought 1/2 meter of this ghost print, but it worked out perfectly for this colorblocked version! It's paired with a minty green French Terry that I can't remember where I bought from. 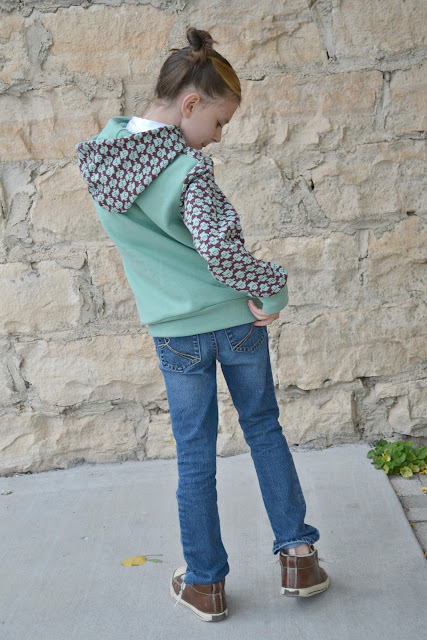 Since I didn't have any rib knit in a color that matched, I veered from the directions and used the mint french terry for cuffs and hem band. While making this, I had the younger 4 all come in, get the wide eyes and exclaim, "is that for me????" As you can tell, I have 2 very sad monkeys because they're too big for this hoodie and one very anxious 4 year old to grow into it. They wont be disappointed for long though, because there are some in the works for the other kids! Again, you can buy the Longihood here! Make sure to check out all the other Ambassadors too! I love this. She looks so happy in her new hoodie! 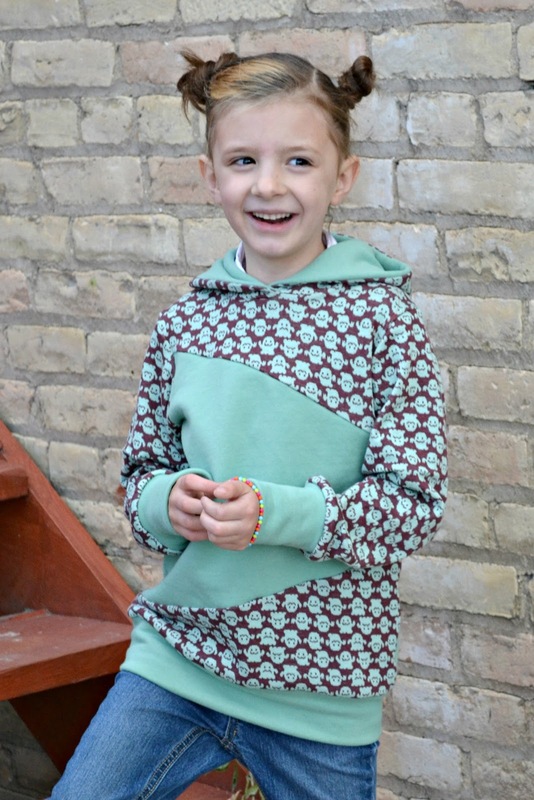 This is one of our favorite new patterns now too! That mint french terry has me all dreamy...let me know if you remember where you got it from!